Diaper bags have been around for a really long time now. Back in the day, people just used regular bags to carry around all of their child’s necessities when they go out. But with the time changing so did the diaper bag. People started realizing that carrying a regular bag in a social setting to tend to your child’s needs as quickly as possible was rather impossible. There was clearly a need for a proper system to be put in place, and that’s where the modern diaper bags arose. The construction of modern day diaper bags clearly had more thought put into it. There was space in the bag that was allotted for each item so that the parent would not be overwhelmed with any mess and can access it as quickly as they can. Further down the road, especially today, having just a diaper bag does not cut it anymore. People are extremely style conscious, and a big bulky diaper bag does not suit their style and just attracts unnecessary attention to it. Thankfully, we now are in a time where diaper bags are really trendy. But, very few companies can really hit that sweet spot, which is a perfect balance of having a well-equipped and functioning diaper bag that also is very chic and stylish. People long for something like that and if you belong to that group, then, you would be really delighted to know about the diaper bag we are reviewing today. It is a perfect blend of those two characteristics, and as a parent, you would certainly desire that. We are talking about the RUVALINO Baby Diaper Bag. Right off the bat, when you first see the RUVALINO Baby Diaper Bag, you will never be able to guess that it’s a diaper bag. It is a very stylish bag that resembles a duffel bag that you would see a model walking around with, in an airport. 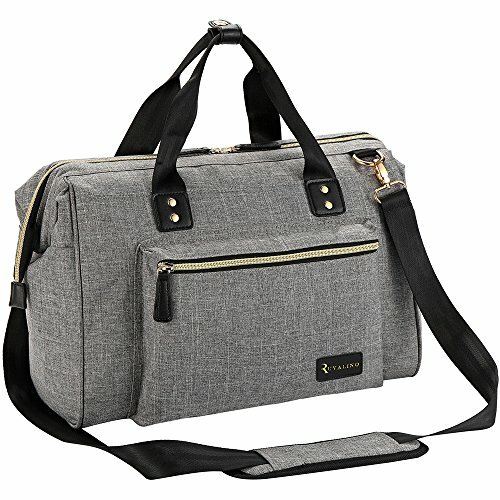 This duffel bag-looking diaper bag is available in color dark gray and has handles and a strap that is black. The bag has a unisexual design so it compliments both men and women. The bag weighs in at just two pounds, and its dimensions are 11.8 x 14.9 x 6.3 inches. The bag is constructed from a very strong and durable nylon material, yet it is really lightweight. The interior is made from an easy-to-wipe polyester, and the exterior can be spot cleaned. The company claims that the stitches are really strong and will never fray. Even the zippers on this bag are highly strong and durable. Now to speak about the most important factor of it all, the space in this diaper bag. Ultimately, what makes or breaks a diaper bag is how roomy it is and how well can all of your baby’s things can be organized within. The opening of the bag is large and wide. There is only one main compartment with space allocated for different items. There is a zipper closure within to keep your valuables. Right in front of it are three pockets. One of which is a pacifier pocket and the other two are regular pockets. Located on one side of the bag are two insulated bottle holders to keep the milk warm. In between all of this is a ton of storage space for you and your baby’s belongings. Due to its rectangular design, it sits very well without leaning or falling anywhere. There is an additional zipper pocket in front of the bag to store things for quick access, such as tissues or your phone. The bag was built keeping in mind all of your baby’s essentials so that they are stored in the right place without causing any mess or clutter, and this makes it look really organized. It also has a fantastic multifunctional design and can be carried multiple ways. Either you can carry it as a tote bag, or you can use the shoulder strap and make it into a crossbody bag. When you are traveling, you can fasten this bag to your suitcase and drag it around instead of carrying it. This very comfortably latches on to your baby’s stroller as well. Additionally, RUVALINO has an excellent customer care support that you can call if you have any issues with the bag. They offer their customers a one-year warranty, and if you are unsatisfied with this bag, then they also offer a 90-day, money-back guarantee with no questions asked. It can be fastened to the suitcase and stroller. Its unisexual design makes it attractive to both men and women. All the baby’s belongings can be placed inside the allotted space. The pockets on the outside and within help keep things organized and avoid any clutter. The bag is made from a very strong and durable nylon material and can be spot cleaned. Multiple ways to carry the bag. It comes with a diaper changing pad. Comes with a year-long warranty and a 90-day, no questions asked money back guarantee. Color may not be similar to what you see on the internet. Could have more storage space. The RUVALINO Baby Diaper Bag is made keeping mind for both moms and dads. Their stylish unisexual bag design attracts the attention from both the sexes. In addition, to being stylish, this bag also has a ton of space within which is great to have an organized bag. It is made from a material that will last for a very long time and can be washed easily. Even after the child grows, this bag can be used as a functional weekender tote bag. The Isoki Baby Diaper Bag is a somewhat similar product to RUVALINO Baby Diaper Bag because it is also stylish, easy to clean, and spacious. It also has several pockets that total to 13, which is more than what RUVALINO has. However, instead of insulated pockets, this product comes with a separate insulated bottle holder. Both products also come with a foldable diaper changing mat. However, the Isoki bag comes with an additional purse for your personal belongings. However, the style of the bag is exclusive for moms. If maintaining your style is essential to you while carrying around a diaper bag, then the RUVALINO Baby Diaper Bag is recommended for you. With 11 pockets, including two thermal pockets, this stylish tote bag has all the capabilities of a large diaper bag. Likewise, the strong and durable construction of this bag makes it an even more attractive deal.